Raaga.com: Bollywood actor Gulshan Grover to shoot a film song at Prince Charles’s Dumfries House!!! Bollywood actor Gulshan Grover to shoot a film song at Prince Charles’s Dumfries House!!! Bollywood actor Gulshan Grover better recognized as ‘Bad Man’ of Bollywood for his various villainous roles has found an admirer in no less than the Prince of Wales. Prince Charles, known for his attraction for Bollywood recently met Gulshan Grover and was so impressed by the actor Prince Charles agreed to allow Dumfries House to be used for a spectacular song-and-dance routine in a Bollywood movie. Elated at the opportunity to shoot in the royal mansion, Gulshan Gover said, “I was really amazed at the royal estate in Dumfries and requested Prince Charles to make it available for a Bollywood film. “Being the gentleman that he is, he agreed in principle to let it happen. I am hoping to return to shoot for a movie, or at least all the dancing song sequence of my new film,” he added. According to close aids of the Royal family the Royal Family generally is reluctant to allow filming in its residences, but Prince Charles is known to enjoy rubbing shoulders with show business stars. 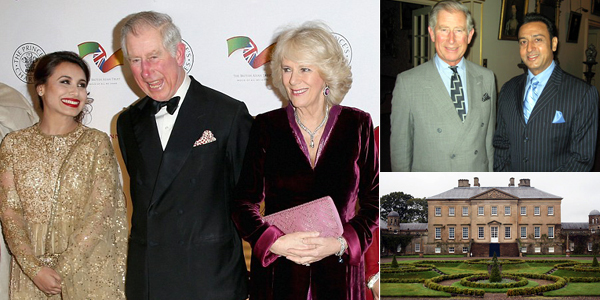 If readers may remember recently this year in February Prince Charles and Camilla, Duchess of Cornwall, rubbed shoulders with celebrities, Bollywood stars and X Factor judges at a gala dinner for the British Asian Trust. Charles joked with Indian actress Rani Mukerji, who glittered in a stunning gold sari.